Are you a family with young children looking for a fun morning or afternoon float trip? Are you a group of beginners wanting to try your hand at rafting? Are you an adrenaline junkie who just wants the best of big water? Then we have the trip for you! We offer a wide range of half day rafting trips that are suitable for groups of any size or experience level in the Colorado Springs, Denver, or Buena Vista area. We’d love to help you figure out which white water rafting trip is perfect for you! There is so much to experience in Colorado, and if your schedule only allows for a half day rafting trip, there are plenty of options. We offer morning or afternoon trips on mild or wild white water, allowing you to spend a few hours on the beautiful Arkansas River. A family-sized taste of white water adventure, paired with the perfect amount of calm Royal Gorge scenery. Colorado white water rafting – no experience necessary! Feel heart-pounding excitement in class III and IV rapids more than 1,000 feet below the Royal Gorge Bridge. Whitewater rafting you’ll never forget, in a trip crafted just for you. Our Family Float Trip is a gentle, five-mile long float down the Arkansas River, with a few class II and easy, mild class III white water amidst the beautiful scenery of the upper Bighorn Sheep Canyon. Join us for a half day, full day or multi-day group whitewater rafting trip or turn your groups' adventure into a learning experience. This timed challenge is best described as an obstacle course that meets the river. You will battle alongside your teammates to be the first raft through Bighorn Sheep Canyon (Class II-III) while completing a series of challenges along the way. 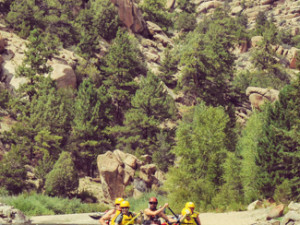 Echo Canyon River Expedition’s Browns Canyon trip is widely considered one of the best Colorado rafting trips in the United States. Running parallel to a wilderness study and offering unmatchable scenic views of the Rocky Mountain countryside, this trip is one of the best family float trips available on the Arkansas River. The Numbers section of the Arkansas River is widely considered to be the most extreme, adrenaline-pumping section of the river, so you’d better be ready for some true white water challenges! The Gold Rush section of Clear Creek rafting with Echo Canyon River Expeditions is the perfect blend of natural beauty, excitement, and fun. Whether you are with friends, co-workers, or family, this is a wonderful way to take in the spectacular natural wonders of Colorado while having the time of your life. Take things up a notch and paddle adventure-class whitewater with our Upper Clear Creek Intermediate Half Day or Full Day trips. You won't get much practice time before you drop into the first class IV rapid on this technical and steep run! For groups with children or individuals who are looking for a great introduction to white water rafting, the Bighorn Sheep Canyon half day rafting trip is a perfect option. This lovely 6-mile, class II-III section of whitewater offers about a dozen rapids that will both excite and exhilarate. You’ll hit fan favorites, like Spikebuck, Sharks Tooth, and Spinner Rapid, that will put a smile on everyone’s face! On all Bighorn Sheep Canyon white water rafting trips, your group has the option of paddling or simply riding along, depending on your desired physical activity level or group composition. You may even have an opportunity to see some of the canyon’s namesake – Bighorn Sheep – on this section! We recommend that children are at least 6 years of age to participate in this section. For those with very small children (as young as 3 years old) or for those looking for a relaxing half day rafting float trip, our Family Float is a gentle ride down 5 miles of the Arkansas River in the upper Bighorn Sheep Canyon. Your guide will navigate a number of easy rapids as you and your friends and family enjoy the view of red rock cliffs and Rocky Mountain wildlife. Depending on water levels (which vary throughout the season), you may even have an opportunity to stop along the side of the river to splash, play, and enjoy a refreshing swim in the river! For the most adventure and adrenaline possible, there is no better half day rafting trip than the Royal Gorge. It is not only an absolutely incredible geological sight, the Royal Gorge is also home world-class white water. You’ll be paddling between two 1,000-foot cliffs through class III and IV rapids such as Wall Slammer, Boat Eater, and Sunshine Falls. You’ll even get to float right under the famous Royal Gorge Bridge. This section varies a great deal during the season as water levels fluctuate due to spring runoff. To determine what time of year would be best for you, check out more information on the best time to raft in Colorado. Adventure seekers will want to book their trips in early to mid-June for the biggest white water rafting possible. We also offer half day rafting trips through Browns Canyon or the Numbers, for those who are looking for something closer to Buena Vista, Salida or Breckenridge. These sections run through beautiful and scenic areas of the Rocky Mountains and will give you a good taste of the beauty that southern Colorado has to offer.